DIE Mercurii, 16 die Januarii. Message to H. C. with Mildmay's, and Swaffham Churches Bills. Ly. Masham took the Oaths in order to Naturalization. Message from H. C. to remind the Lords of the Canary Company Patent; --and L. Mordant's Impeachment. 1. To return them the Bill concerning selling some Part of Mr. Mildmaye's Estate, with some Alterations, to which their Concurrence is desired. 2. To deliver to them the Bill for uniting the Two Churches in Swaffham, and to desire their Concurrence therein. ORDERED, That the Earl of Craven is added to the Committee for making Provision for such Places and Persons as are infected with the Plague. This Day Dame Mary Masham, Wife of Sir Francis Masham, took the Oaths of Supremacy and Allegiance, kneeling, at the Bar, in order to be inserted into the Bill of Naturalization. The Duke of Bucks reported the Bill against defrauding of His Majesty's Monies, &c. with some Amendments; which were read Twice, and, after Debate, ordered to be re-committed; and the said Committee to meet this Afternoon; and the Earl of North'ton is added to this Committee. ORDERED, That the Committee for the Bill concerning burying only in Woollen do meet this Afternoon. "The Condition of this Recognizance is such, That if the above-bounden Beaumont Hastings shall behave himself well and honestly, both in Word and Deed, towards the King's Majesty and all His Subjects, especially towards Thomas Lord Morley and Mounteagle, a Peer of this Realm, until the next Session of Parliament, then this Recognizance is to be void and of none Effect; otherwise it is to be and remain in full Force and Virtue." 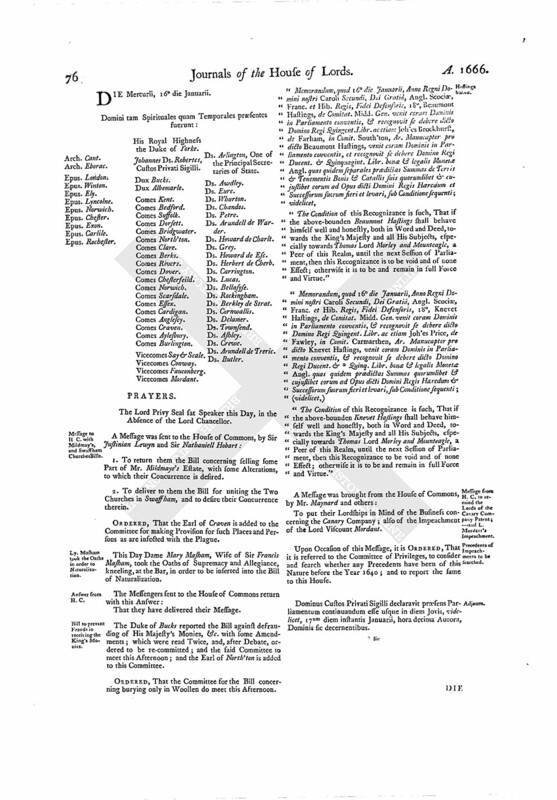 "The Condition of this Recognizance is such, That if the above-bounden Knevet Hastings shall behave himself well and honestly, both in Word and Deed, towards the King's Majesty and all His Subjects, especially towards Thomas Lord Morley and Mounteagle, a Peer of this Realm, until the next Session of Parliament, then this Recognizance to be void and of none Effect; otherwise it is to be and remain in full Force and Virtue." To put their Lordships in Mind of the Business concerning the Canary Company; also of the Impeachment of the Lord Viscount Mordant. Upon Occasion of this Message, it is ORDERED, That it is referred to the Committee of Privileges, to consider and search whether any Precedents have been of this Nature before the Year 1640; and to report the same to this House. Dominus Custos Privati Sigilli declaravit præsens Parliamentum continuandum esse usque in diem Jovis, videlicet, 17um diem instantis Januarii, hora decima Aurora, Dominis sic decernentibus.